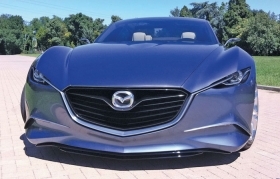 The Shinari concept flashes the future face of Mazda. The automaker uses the word "kodo," Japanese for "soul of motion," to describe that design language. MILAN, Italy -- Less than a year ago, Mazda strengthened its r&d efforts with $1.1 billion raised from the equity markets. The introduction of Mazda's new design language, combined with the future development of engines, architectures and technology, represents the first result of that investment. "Given all of the changes in the industry in the last year, we realized we had to invest in our products to have a chance," said Jim O'Sullivan, Mazda's North American boss. "During the depths of the recession, we knew this move was needed." The result of that effort is the design language shown last week on the Shinari sports coupe, a four-door concept that indicates the design direction for the Japanese brand. The coupe shows the future face of Mazda's family of vehicles -- an aluminum signature wing -- as well as the overall styling trend for future production models. Mazda uses the word kodo, Japanese for "soul of motion," to describe its future design language. Executives call the new design language an evolution of the swoopy "Nagare" styling philosophy that will debut on the redesigned Mazda5 compact minivan that goes on sale in January. Mazda executives declined to say when the new design will appear on production vehicles. However, "this design will lead to the next generation of Mazda design and will lead to other elements," said Ikuo Maeda, general manager of Mazda Motor Corp.'s design division. Mazda also plans to increase the quality level of its interiors over the next three years. "We want to play in the same group as BMW and Audi," said Derek Jenkins, director of design for Mazda in North America. "On fit and finish we want the same level of quality." Mazda recently introduced its Sky direct-injection gasoline and diesel engines, which are scheduled to arrive in the United States next year.